Published in 2015 our newest publication is our cook book "A Taste of Rockhill History". This is not your ordinary cookbook. 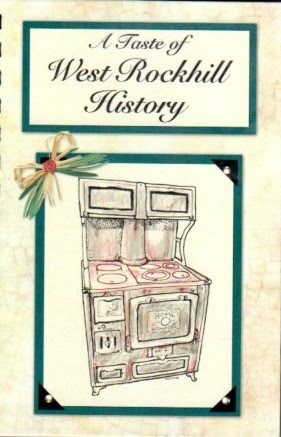 We have included not only recipes, but history and memories of the people of West Rockhill and how they lived and ate from 1900 to the present. Some of our recipes are more than 100 years old. The recipes range from Typical Pennsylvania Dutch fastnachts (donuts) to some recipes that are not so common today such as Groundhog, but were everyday fare in the late 19th and early 20th centuries.This cookbook spans the decades and the palate. From stuffed peppers to pumpkin custard. The cookbook can be purchased at the West Rockhill Township Building, Reclaimed Relics at 255 Route 313 Perkasie, Pa.,The Rockhill Filling Station Family Restaurant at 1710 N. Ridge Road Perkasie, Pa. and the Upper Bucks Chamber of Commerce and Visitor Center at 21 N. Main Street, Quakertown Pa. Or contact us at brephe@gmail.com. The cookbook costs $15.00 with a $5.00 postage fee.